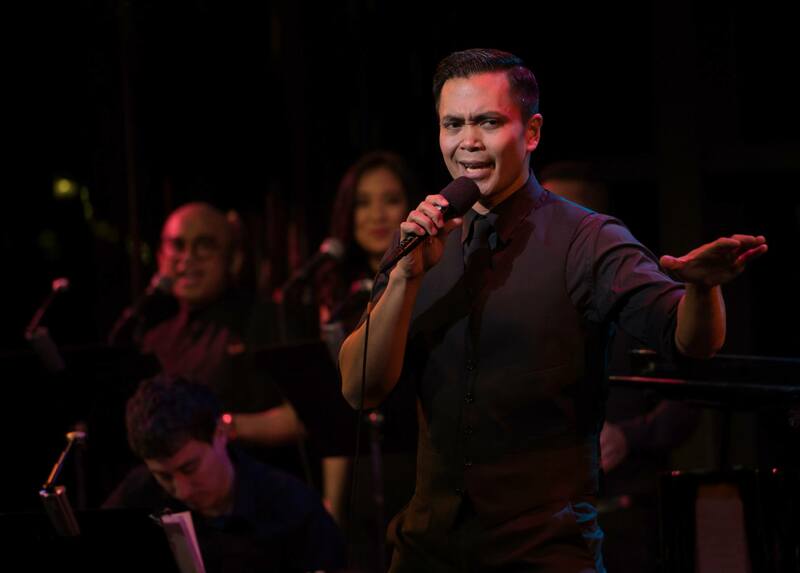 Jose Llana’s American Songbook concert had no title or theme. He sang songs from shows he’s appeared in, a few pop numbers from the likes of Billy Joel and George Michael, and one ballad in Tagalog from his uneasy attempt at pop stardom in the Philippines. Despite the fairly standard cabaret structure, there was nothing ordinary about what happened on the stage of The Stanley H. Kaplan Penthouse at Lincoln Center on Thursday night. Llana demonstrated that he is an exceptionally versatile performer, thrilling the audience with contemporary pop songs and Broadway standards alike. Llana was most recently seen on the New York stage as Ferdinand Marcos in Here Lies Love, the David Byrne-Fatboy Slim disco musical at the Public Theater. The concert featured two numbers from that show, including one (“Child of the Philippines”) he did not get to sing in the actual production. But the evening’s tour through his previous roles was a forceful reminder of his range, showcasing his romantic tenor in numbers from The King and I and On The Town and his facility with comedy in “My Unfortunate Erection” from The 25th Annual Putnam County Spelling Bee. The five-piece band, under the enthusiastic leadership of Kimberly Grigsby, and backup group of Jaygee Macapugay, Jeigh Madjus, and Enrico Rodriguez (three of Llana’s cast mates from Here Lies Love) were the perfect glue to provide continuity across the numerous genres of music featured. Charts by Matt Stine and Cody Owen Stine ensured that Leonard Bernstein, Jackie Wilson, and Ed Sheeran would all sound of a piece on the program. Jack Bashkow deserves special mention for livening up the evening with some killer sax solos. Between songs, Llana spoke earnestly about launching his career so suddenly when he won a lead in the 1996 revival of The King and I during his freshman year of college, learning how to balance his identity as an American immigrant with a connection to Filipino culture, and his experience as a gay man in show business. Judging by the lineup of directors and producers spotted in the audience, Llana is equally beloved in the industry as he is by his fans, so we can all hopefully look forward to seeing him on the boards again soon.